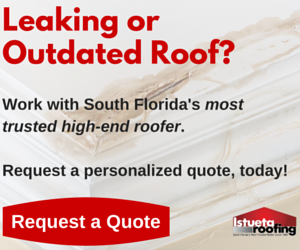 Here at Istueta Roofing in Miami, Florida, we have three core values: Trust, Integrity, and Pride. We believe that having core values helps us to focus on being the best roofing business we can be and also it lets you all know what we strive to be. What’s the secret to my roofing business success? If it comes down to one word, that word is “trust.” Without trust, nothing else is really possible. We are committed to doing the right thing and being ethical. We were talking with an architect the other day who has a client who keeps focusing on and worrying about price. We told them that it’s probably in the client’s best interest to worry more about the durability of the product and the end result because they will suffer the consequences of a low-quality job. I feel like there’s a trust that we create with our clients, architects, general contractors, and homeowners. They know that we have their best interest at heart. If there is something that is going to risk our reputation and risk the homeowner’s satisfaction with their new roof then it is something that we aren’t going to do. All of our roofing clients really appreciate our honesty. We aren’t afraid to tell them flat out, “This is a bad idea.” With high-risk projects, we’ve even told people that if they are going to continue with the project that they go with a different company. We won’t take on projects that aren’t within our moral scope. We’re lucky to be able to be picky after building up our reputation. We stitched the word “Trust” into one sleeve of our uniform. The word “Integrity” is on the other sleeve. Trust is the #1 reason that we’ve been in business since 1985. That’s why people choose us for their roofing projects over their other options. We are such experts on trust and customer service that I’ve even written a chapter in a book about it! A few weeks ago, I had a client meeting in the morning. The client decided to sign with us and he let me know that one of the reasons that he chose Istueta Roofing is because he saw the word “Trust” stitched on my sleeve. He said seeing “trust” written there helped make the decision much easier. When it comes to your Miami roof, you deserve the best in the business. You can trust us to be the right choice for your residential or commercial roofing project.